MAE Landscaping is the only company you need to contact when considering a landscaping designer in Snohomish County and Northern King County. Our company specializes in a diverse range of services and products to fit your every need. However large or small your landscaping ideas may be, we have the tools, experience, and know-how to get the job done. Complete Landscape Design – Do you have an idea of exactly what you want your yard to look like? Do you have no idea what you want, but know some of the key features you cannot live without? Our team of designers will work with you to formulate a plan that will turn your dreams into reality. Water Feature Installation – From waterfalls to streams, ponds and bubbling rocks, we can provide your yard with a sense of serenity with any one of our beautiful water features. 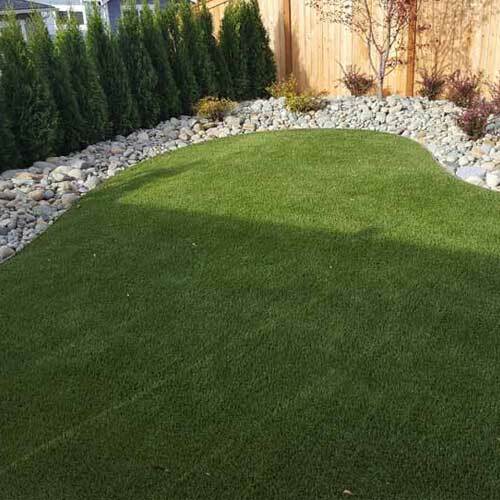 Artificial Grass – Stop worrying about mowing the lawn, reseeding, letting the dog play on your grass and other issues that come with having a lawn seeded with natural grass. With the use of our state-of-the-art synthetic turf installation techniques, you will have a lawn that is green all year round and looks real too! We also install artificial putting greens in your backyard, front yard or even inside of your house. Practice your putting game without distractions in your own home! Walls – Segment your yard with one of our expertly constructed walls. MAE Landscaping can accommodate your every desire, from a rustic-looking wooden divider wall to an ornate tile accent wall and much, much more. Hardscapes – Patio design, fire pits, driveways, courtyards and other hardscape features are aspects of Snohomish County and Northern King County landscape design that we are very familiar with. In a climate such as ours, it is important to take weather, durability of materials and the customer’s wishes into consideration. Our goal is to provide you with the landscape design of your dreams. MAE Landscaping offers landscaping services for Snohomish County and Northern King County’s commercial and residential clients alike. Wow clients and employees with a stunning evergreen synthetic lawn complete with a pond for your staff to enjoy while on breaks. Surprise friends and family with a lavish backyard entertainment area featuring a vast fire pit, or be the envy of the neighborhood with a personal putting green that never gets brown or dry. Our professional design team will work with you through every step of the process to come up with a design that is functional, luxurious and truly spectacular. Contact MAE Landscaping today for a quote on your dream landscaping project!